Somehow I end up reviewing a lot of comic biographies, even though I don’t like the genre much. The good tend to be exceptions. The bad feel like homework or a grocery list. But the field is improving, with author/artists like Joe Ollmann and Peter Bagge turning to nonfiction. An increasingly international list of creators (Steffen Kverneland, for example) is also choking out the weaker attempts. 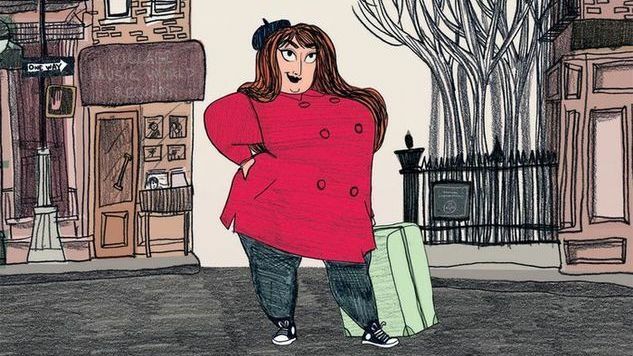 Pénélope Bagieu’s California Dreamin’: Cass Elliot Before the Mamas & the Papas offers a daunting proposition. The era of ‘60s flower-child music is over-romanticized, the outlines of Elliot’s life are well known and the subject is primarily auditory, which makes it difficult for a medium that doesn’t cater to that sense. But Bagieu clears those hurdles with style while depicting the life of a woman who made huge musical contributions while struggling with her body image and substance abuse. The cartoonist works in pencils, with no color, but the graphic novel doesn’t need bright hues to roil with life. Bagieu’s line feels personal, as though the reader puts it down on the page with their eyes as they read it. Instead of being cleaned with ink and Photoshop, the aesthetic has an organic quality that fits the story of a woman defined by rough and soft contrasts. The character design evokes illustration from the period in which the story takes place (more Bobby Hillson’s fashion drawings than Saul Bass’ flat blocks of color). It’s slightly cartoony without overindulging. The individuals who interact have obvious physical characteristics (Elliot’s swirling hair, rosebud mouth and tiny feet), but they don’t cross the line into saccharine twee or cuteness. Bagieu employs a touch of Vanessa Davis’ realism, especially in the gently looping, cursive lettering and in some of the messier compositions. There’s always an untied shoelace or cigarette smoke interfering with a carefully composed panel to remind us that reality isn’t so neat. Bagieu structures her story well. Each chapter offers a new perspective on Elliot’s personality and talent through a different character: family members, enablers, teachers, onlookers. Their narratives knit together to form a baggy but cohesive whole. Part of the book’s magic is that the cartoonist knows when to quit when she’s ahead. As the subtitle conveys, the book only ventures so far, avoiding Elliot’s depressing end (she died at 32). If a graph charted the musician’s happiness, the line would mostly slope up, with a few small zigzags. Whether this is the best approach could be argued, but it does make the story fresher and more satisfying. California Dreamin’ isn’t interested in serving as a cautionary tale, although Elliot’s drug use certainly plays a part in book. Instead, it’s a wary love song to a complicated artist who provided the world with moments of flowery joy.